Just in time for the Fourth of July, North Korea says it has successfully tested its first intercontinental ballistic missile (ICBM). The country voted most likely to start WWIII says it can now strike targets anywhere in the world, but military experts believe the missile, which flew for 40 minutes, is a medium range weapon that presents no threat to the United States. Early this morning, North Korea fired a missile from the vicinity of Banghyon, North Pyongan Province that flew more than 578 miles (930 km) before dropping into the East Sea near Japan, according to US Pacific Command. North Korean state television, with its usual bombast, said the country is now “a full-fledged nuclear power that has been possessed of the most powerful intercontinental ballistic rocket capable of hitting any part of the world,” adding that the weapon will enable the country to “put an end to the US nuclear war threat and blackmail” and defend the Korean peninsula. A missile of that range would need to fly on a very highly lofted trajectory to have such a long flight time. Assuming a range of 950 km, then a flight time of 37 minutes would require it to reach a maximum altitude of more than 2,800 km (1700 miles). So if the reports are correct, that same missile could reach a maximum range of roughly 6,700 km (4,160 miles) on a standard trajectory. That range would not be enough to reach the lower 48 states or the large islands of Hawaii, but would allow it to reach all of Alaska. Both the United States and Russia appear to agree with this assessment, saying North Korea has developed a medium-range missile that presents no threat to either country. 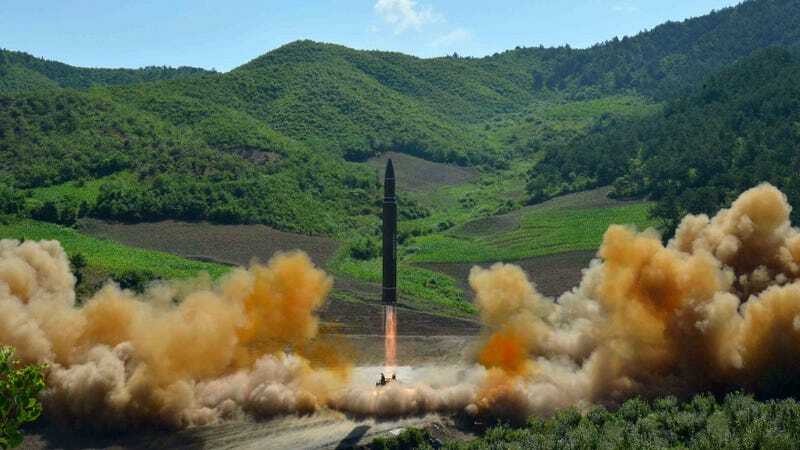 What’s more, there’s no indication that North Korea has developed the capacity to miniaturize a nuclear warhead such that it can fit onto a missile. These caveats aside, it’s clear that North Korea is inching closer to its goal of becoming a global nuclear power. The timing of the test—on US Independence Day—is likely deliberate, and a stark warning to Washington and its allies in the region. The test comes just a few days after the first face-to-face meeting of the leaders of the US and South Korea. President Trump was quick to chime in about the tests in a pair of tweets. Indeed it is, as the folks in Alaska are now all too aware.